Former Harris County Commissioner Sylvia Garcia is headed for the Texas Senate after beating state Rep. Carol Alvarado in a Saturday special election runoff to succeed the late Mario Gallegos, D-Houston. 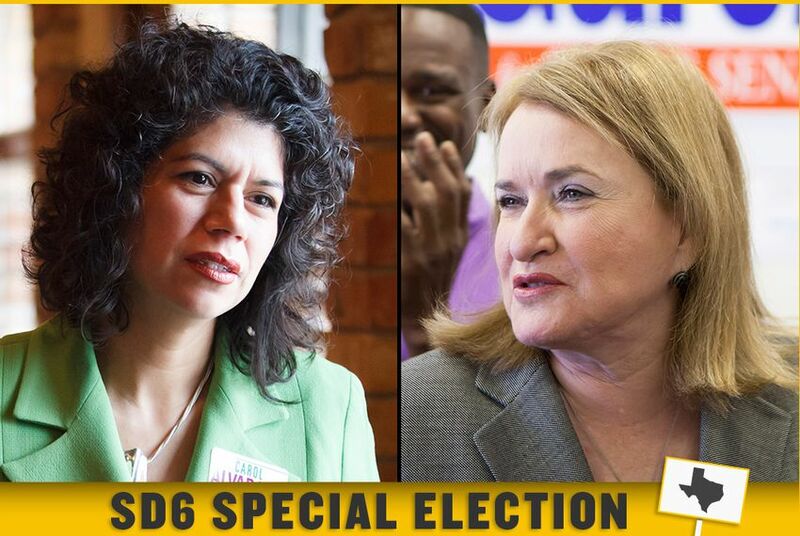 State Rep. Carol Alvarado (left), D-Houston, and Former Harris County Commissioner Sylvia Garcia are among the eight candidates vying to replace the late Sen. Mario Gallegos. Updated, Saturday, 10:45 p.m.: Former Harris County Commissioner Sylvia Garcia defeated state Rep. Carol Alvarado for a seat in the Texas Senate, winning a runoff with 52.9 percent to Alvarado's 47.1 percent. The voting in Saturday’s runoff between the two Houston Democrats capped an expensive and hard-fought special election to replace the late Sen. Mario Gallegos, D-Houston. With about 95 percent of precincts reporting, Garcia had 9,562 votes to Alvarado's 8,514. That represents a turnout of about 6 percent. The announcement of the results set off thunderous applause at an events hall off I-45 where hundreds of Garcia’s supporters had gathered. Garcia acknowledged the timing of the election could limit what she might have done with a full term; the Legislature will have two months behind it before she takes office. Alvarado tweeted her intentions when the results were clear: "I go back to Austin on Monday, and I won't skip a beat!" Garcia said she will make health care and public education her priorities and said she anticipated that the delegation, which was split in its support between the two candidates, will heal and come together. Both she and Alvarado will be in Austin now as members of the same delegation. “It’s all about moving forward and moving the ball forward and making sure we get things done, not only for this district but for the state of Texas,” she said. State Rep. Armando Walle, D-Houston, was one of Garcia’s earliest supporters and said Saturday’s election means the delegation has added a strong and motivated Latina to fight for Houston. HOUSTON — About 650 votes separate the two Harris County Democrats vying to replace the late state Sen. Mario Gallegos in Houston’s Senate District 6, early-voting tallies released Saturday night show. State Rep. Carol Alvarado, D-Houston, a former Houston city councilwoman who is serving her third term in the Texas House, garnered 4,448 votes, about 47 percent, and Sylvia Garcia, a former Harris County commissioner who also served as a city of Houston controller, earned 5,101, or 53 percent of the approximately 9,550 votes cast during the early voting period from Feb. 20 to Feb. 26. Saturday’s special election is the result of a Jan. 26 election in which Alvarado and Garcia emerged as the top two vote-getters from a field of eight candidates. In that contest, Garcia finished with 7,416 votes, about 45.4 percent of the ballots cast. Alvarado received 6,803, about 41.6 percent. Gallegos, the first Hispanic senator to represent Harris County, died Oct. 16 from complications associated with a 2007 liver transplant. Alvarado’s camp was also cautious not to read too much in to Saturday’s first tallies. “After early voting we’d obviously like to be in a better position, but we’re just going to see what happens,” said Marc Campos, Alvarado’s campaign manager. The early voting totals reflect a lackluster turnout of only about 9,550 voters in the district. Voter turnout was also low during January’s contest. Fewer than 16,000 – or about 5.6 percent – cast ballots. The eventual winner will have to catch up in a legislative session in full swing. The 140-day session began Jan. 8 and will end May 27. The deadline to file legislation is this Friday. Harris County has 10 days to canvass the results after Saturday’s contest, and Gov. Rick Perry's office of has an additional four days. The winner cannot take her oath until the governor’s canvass, which means the victor will not be able to file any bills after taking office. Saturday’s election caps off a contest that began in earnest last fall following Gallegos’ death. Garcia and Alvarado were considered the front-runners since each announced their intention to run. Alvarado quickly secured the support of Gallegos’ family and of state House Black Caucus lawmakers, including Houston Reps. Harold Dutton, Borris L. Miles and Senfronia Thompson. Sens. Rodney Ellis, D-Houston, and Leticia Van de Putte, D-San Antonio, have also backed Alvarado. Garcia’s support came from key Hispanic Democrats in the Houston delegation, including Rep. Jessica Farrar, the former House Democratic Caucus leader, and Reps. Ana Hernandez Luna and Armando Walle. The legislators actively supported Garcia on social media sites and were with her in Houston during the January election. The race has also been expensive. From Jan. 17 to Feb. 22 Alvarado raised about $582,000 and spent about $463,000. She had about $99,000 remaining and currently has no outstanding loan balances, according to her most recent finance report. She also lists more than $190,000 in contributions in pre-election telegram reports, which are filed to report funds received after the date of the last report. The contributions include $75,000 from Texas for Lawsuit Reform PAC, which also heavily supports Republican candidates. Former Houston Mayor Bill White, a Democrat, and his wife Andrea gave Alvarado about $30,000. During the same time, Garcia raised more than $662,000, spent $641,400 and had about $119,000 on hand. Like, Alvarado she does not list any outstanding loan balances. More than $350,000 of Garcia's contributions came from the law firm of Houston trial lawyer and Democratic backer, Steven Mostyn. In four pre-election telegram reports, Garcia lists more than $58,000 in additional contributions, including $25,00 from the Texas Trial Lawyers Association. We will update this post when final results are reported by the Harris County Elections Office.